Targeting prospects who are interested in your competitors can be pretty simple with a targeted list of competitor related keywords in SEM. However, when it comes to competitor targeting on social platforms, it’s time to roll up your track suit sleeves and put on Run D.M.C, cause it’s tricky! Have no fear, it is possible to target your competitors across Facebook, LinkedIn, and Twitter with just a few simple steps. Generally, you’ll have a pretty solid idea of who your company’s top competitors are. While targeting this list of known competitors is beneficial, it is also important to look for your top competitors on each social platform. This helps ensure you are spending your budget for social competitor targeting most efficiently on a platform by platform basis. There are a number of ways to identify your social competitors. Start by picking your top keywords, the ones that really get at the meat of what you do. The ones that your competitors use to describe their industry or product. For example, if your company sells Customer Relationship Management software, then “CRM software” or “customer relationship management software” is probably your most popular keyword. Followerwonk is a great tool by Moz that helps identify influencers and leaders in the industry. Using the “Search Bios” tool you can use the keywords you identified earlier to search for potential new competitors who are using Twitter. BuzzSumo is a pretty spiffy tool with useful features, including content research across channels based, influencer data for twitter, backlinks data, and trending now features. Once you’ve put together a list of your top social competitors and your known competitors, it’s time to cherry pick. Oh yes, you heard me. 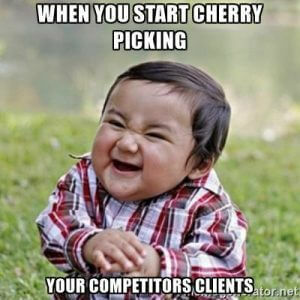 You should start cherry picking your competitors clients. No seriously, just pick the clients you want and target them. Why? Because you want their customers, that’s why. You already know they have a need for your services and hopefully you already know what you do better than your competitors, so creating content and messaging should be a snap. How do you find your customers clients? The easiest way I’ve found, is to look at your competitors sites. Scour them for customer stories, testimonials, customer logos, etc. and just pick the cream of the crop. Also keep a close eye on, what your competitors are posting and promoting across social platforms to see if there are any case studies including their current clients. Make this a big list, the work will pay off. Now you should have a list of competitors and some cherry picked clients. Set this aside, we’ll get back to it in just a second. 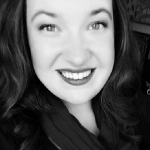 First we need to identify the actual audience to target based off your consumer personas. So who’s it going to be? Who is the person that vetts you and your competitors. Who makes the decision to start using your company’s services/products? This, this is person you want to target. This is your audience. What do they do? Not what is their business, but what do they do? What is their job, how do they think? What are their skills, are they technical or strategic? As a B2B company, there are likely multiple decision makers involved in the buying process. Think about all facets and people involved when creating this strategy. Write them down, because these are your target audience. Great, now what are you going to do with them? There are really two good options. SPOILER ALERT: You can use both! 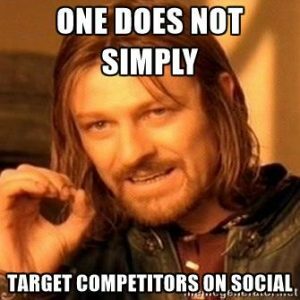 First and foremost, brush off that list of competitors you made earlier and login to your social platforms cause you’re about to do some serious stealth targeting. Across LinkedIn, Facebook, and Twitter there is the ability to break down audiences and target by specific facets. However, across these platforms there is no universal facet available on all platforms to create your audiences. Therefore, for the specific purpose of social competitive campaigns, we mainly want to focus on facets like skills, interests, and group members. Essentially, you’ll be targeting individuals who are already interested, have skills in, or belong to groups for your competitors products/services. Then layering in the personas you want to target, otherwise known as your target audience. Pro tip: Remember to exclude employees from the companies you’re choosing as your competitors. (A) because you’re stealthy and (B) because it’s wasted ad spend. The second option involves a little buzzword called Account Based Marketing, otherwise known as ABM. 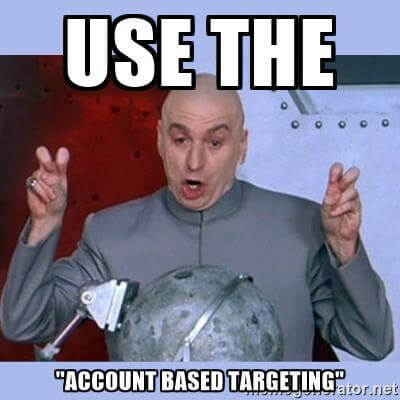 More specifically, we will be using Account Based Targeting. What’s the difference you ask? Here’s where you take your cherry picked client list from your competitors and put them to good use. Across Facebook, LinkedIn, and Twitter there is the ability to target specific companies. While LinkedIn is rolling out a new feature called Matched Audiences that will allow you to target by company name, Twitter still requires you to upload a list called a Tailored Audience, and Facebook requires you to upload a Custom Audience. Both only allow you to target on an individual level rather than a company level. It is possible to target whole companies on Facebook, but it requires manually entering company names one by one. Depending on how many cherry picked companies this is, it can be a lot of work. Therefore, in order to quickly launch ABT on Facebook and Twitter, you’ll need to get a list of employees at your competitor’s clients companies. Once you have your audiences built out, it’s time to develop an offer strategy and craft your messaging. It’s head scratching time, you’ve done all this work and now you’re sitting here thinking, but what do these people want? What will they find compelling? Since this is a competitor campaign, it is the perfect place to talk about your strengths and subtly point out your competitors’ weaknesses. The best way to do this? With third party analyst reports, the most popular seem to be Gartner, Forrester, and G2 Crowd. If you have a higher ranking than your competitors in these reports, you should leverage them to your advantage in your competitor campaigns. If you don’t have any third party reports or you have lower rankings in third party analyst reports, you may find it beneficial to create a competitive matrix asset. Essentially listing out your strengths vs. your competitors to show why your product/service is best. You’ve gotten this far, now you’re in the home stretch. All you have left is to craft your messaging. Be careful now, here’s where it’s easy to make a mistake. I would not recommend pointing out your customers by name in your ad copy. As Ryan Osman touches on in Shorten that Sales Cycle Using Gmail Ads | B2B Secrets using unbiased ad copy is best practice. An example of unbiased ad copy would look something like “Compare Customer Relationship Management vendors. See why Gartner named [Company Name] a leader in CRM software!”. This copy shows the overall benefit of being able to compare multiple vendors, as well as points out why you are better than them. That’s the ultimate goal. For a competitive matrix, the same ad copy principles apply. You’ve done your fair share of work, now launch it and reap the rewards! Keep in mind that competitor campaigns are slightly more expensive than traditional campaigns on social. Similar to ABT campaigns in social, the Cost per Lead and Cost per Marketing Qualified Lead will be slightly higher than your traditional campaigns. However, the leads are typically higher quality and it pays to compete. 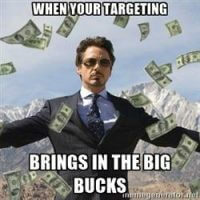 So sit back, relax and watch your targeting bring in the big bucks. I know you don’t want to hear this but, your work is not over. Now is the time to apply competitor targeting across all your digital marketing channels. Download Obility’s Guide to Competitor Targeting with over a dozen pro tips from Obility’s Founder (Mike Nierengarten) on competitor targeting to reach your competitors’ customers and prospects across channels.